Biking where? I had never heard of Bemidji, although I grew up in the neighboring state of Wisconsin. Bemidji is in northern Minnesota, near the Canadian border and close to its more famous neighbor: Fargo. I came not just for cool air and clear lakes. 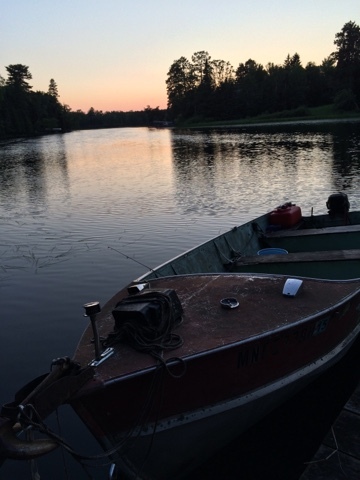 No, the lure was the Northwoods Writers conference, sponsored by Bemidji State University. It has turned out to be the best writing conference I have ever attended (message me if you want to learn more). 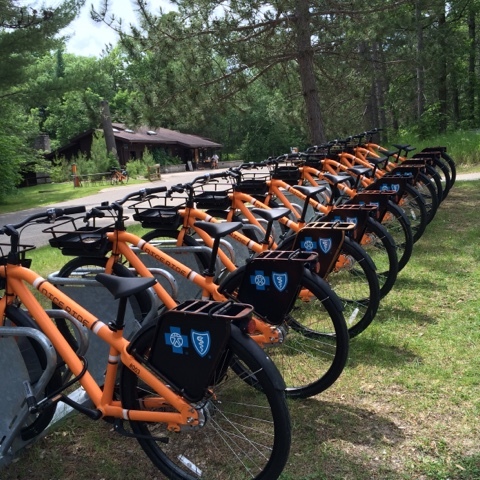 And imagine my joy when I learned that Bemidji – population 13,000 and some change – has a bike share program!!! On the college campus where I spent five nights in a comfortable dorm (I splurged on the air-conditioned dorm with a private room for the stupendous sum of $28 per night…but could have economized on a $17 room, if necessary) I could get an orange Nice Ride bike for $5/hour, with a maximum daily charge of $15/day (or $25 if you kept it overnight). Readers of this blog will know that I sample bike share systems wherever I travel. 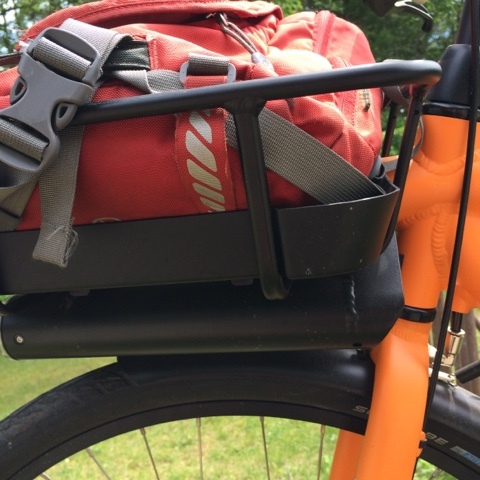 The Bemidji bikes are not your typical 50-pound behemoth. They are sturdy, but not so heavy, and their three gears are just right for the mostly level terrain. Their best feature, however, is a capacious front basket/rack attached to the front pole. I loaded mine up with backpack and water bottle and it moved independently of the steering. It’s just what I need for my bike at home! 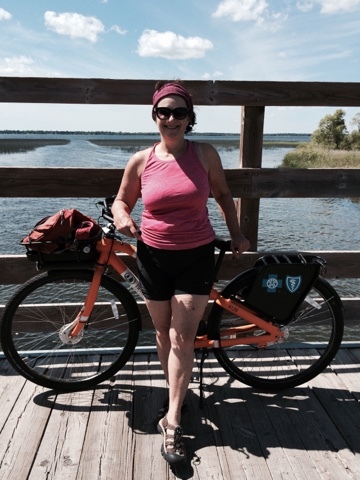 On Sunday I had a free afternoon and set out to bike the 17-mile circuit around Lake Bemidji. Just my luck, I met Trish – another cycling writer – at the rental counter and she joined me for the adventure. She had cycled here the day before and kept me from getting lost. 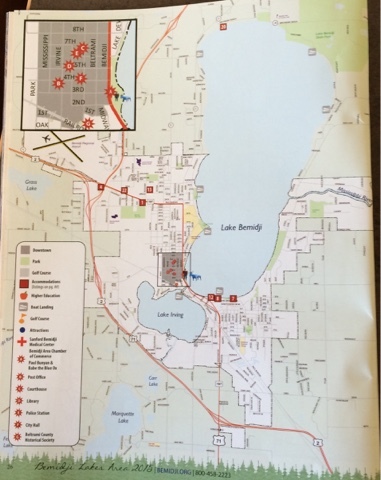 Lake Bemidji is shaped something like a large (right) footprint. 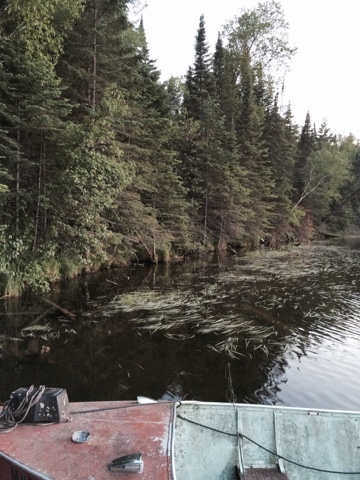 This is the land of Paul Bunyon lore, so perhaps one of his gigantic feet formed the lake. The University is located about where the beginning of the arch would be – above the heel. We decided to cycle in a clockwise direction and so pedaled north toward the big toe and rounded the top of the foot. This turned out to be the least-nice section of the ride, as much of it was on streets and highway. That said, traffic – even on the highway – was more like a country road. There was always a very wide shoulder and Minnesota drivers keep a wide distance from bikes. 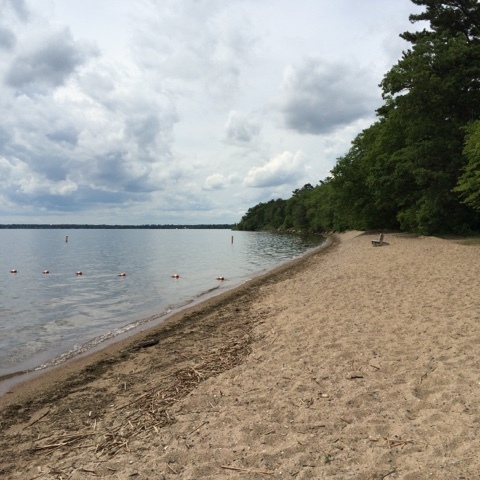 Past the middle toe is Bemidji State Park – a shady forested refuge with a sandy swimming beach and plenty of campsites. I made a mental note to return when I’d have more time to explore. The park ends at the top of the little toe, and we headed south along the nicest portion of the circuit. It is mostly bike and hike path, forested and – even on a lovely Sunday afternoon – we encountered only one other set of cyclists. We continued riding around the heel of the lake. The Mississippi exits just around the inner end of the heel. From there we rode through “town” and returned the bikes. The conference kept me very busy with craft talks, workshops, author readings, and – of course – writing. But I had a two-hour, rain-free window on Wednesday. I grabbed another bike, pedaled the 6 miles to the state park, went for a little swim and rode back refreshed. 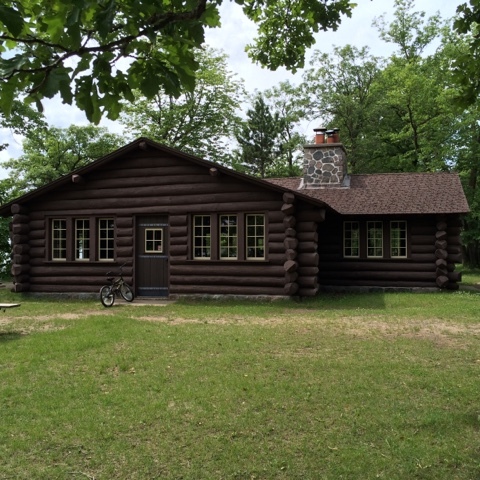 It’s a bit of a haul to get here – a 4-hour drive from Minneapolis – but I would gladly return (in summer) for the conference, the lake, and the bikes. And another chance to look for the elusive Northern Lights.